As you know I live in a tiny over-organized country, and though the tax system is probably the most organized and sneaky in the world, it's hard to show or even explain..
Our roads however are very visible and changing rapidly. Road signaling systems do however work brilliantly! The way it works is that there are loops in the road that register average speed. If the speed in a section is low (bellow 70 km/h) it will automatically sign a speed limit in the section before that. And the newer systems even register a car standing on the hard shoulder and will close of a lane in the section before. 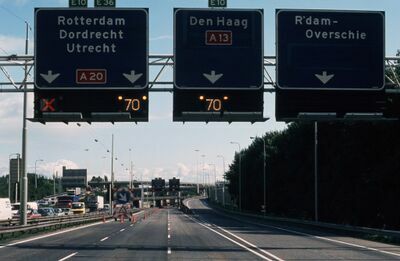 Almost all of Holland is now covered with this system, and the biggest risk is when it does not exist on the road you are on, or if it is malfunctioning. Because I (and I assume many others) have come to rely on it, no need to slow down unless you see the blinking light ahead..
And now they are reconstructing all major highway intersections from the "Clover-leave" model to the "Clover-turbine" model.. 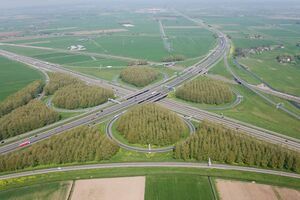 Idea is not to have streams of cars weaving, but give each direction a lane with overpasses. Newest thing, and what I really have difficulty adapting to is variable speed limits which many highways have now. Depending on the traffic, the number on lanes opened, the time of day, and some times because of weather conditions the maximum speed can be 50km/h, 70 km/h, 90 km/h, 100 km/h, 120 km/h or 130 km/h.. And because of the mentioned tax systems we have speed camera's, trajectory measuring systems and traffic cops on every highway..
Do you have these things in your country? Do they function? We still have a few toll bridges, but government is trying to buy those privately built things..
France has a full private (toll) highway system, best road ever, but comes at a price.. Here we have bus lanes, soo frustrating.. A free and empty lane only used by a bus every 30 minutes... (now taxi's can use it too). Smart motorways they call them here... also we have "average speed limits" for roadworks areas... but a lot of people don't seem to understand what "average" means... must be a big revenue earner! Australia has speed cameras, red light cameras, radar patrols on every highway and every means of raising revenue to spend on Government salaries and retirement packages ... bugger all goes back into road or traffic improvement. At least Rak can see where his taxes are spent. Any car here pays road tax, depending on the weight of the vehicle. Mine is a 1500kg diesel, and road tax works out about 120€ a month..
Australia has all those same taxes, Erik. An elderly female acquaintance was pinged twice in one day passing a school long after kids had gone home, had forgotten about the time/speed restriction and paid $840 in fines which was bad enough but the 8 points loss was a severe blow to an otherwise safe and sedate driver. No wonder many of my friends use radar detectors with laser jamming. On topic though, successive State and Federal governments promise new and improved roads but usually fail to deliver. Or the delivery is so delayed it's a constant catch-up game. Holland being small and flat obviously makes it easier to build new and improve roads but having seen what countries like Thailand can do makes Australia look like a 3rd world country in highway development. Where I live the city council have been installing average speed cameras on many routes into the city. One set being fitted to a dual carriageway section close to my house. They have reduced the speed from 40 down to 30mph which seems painfully slow for a dual carriageway. You really have to concentrate to stay below the new limit. Anyway, after six months use it was revealed that nobody had ever received a fine, prompting suspicion that these camera have never been 'live'. So far the council have refused to confirm this. It just shows that these average speed cameras slow people down, whether they are switched on or not. ^ camera signs on the 22 Udon Thani-Sakhon Nakhon have slowed traffic down too. now places that i did 100 in and are posted 50 so have to cool it a bit even though it has become 4 lane dual carriage way recently. haven't seen a camera though,just the sign but....a "sign" of the times. Last edited by Moo Uaon; 23rd July 2017 at 17:57. Invite Ian Forbes over for a couple of weeks. He'll sort out your rabbit problem. No need for photos Ian, well use our imagination this time . The Dutch foxes must be dumbfcks. The only ones who don't clean up the rabbits. Where I live we just have construction everywhere and you have to drive 4 kilometers out of your way just to go a few hundred meters. They plunk in those roundabouts with pretty flowers in the center, and then a month later tear it all up to put in a new sewer or water drain. The one that is currently being done near where I live has been going on for two months and it's not close to being finished. My taxes went up another $300 though, and if they weren't paid on time I would have been charged an additional $200. I don't mind slowing to 25kph for an emergency vehicle provided that I get at least 5km notice, plus graded signed slowdowns every 1km and immediate advice following that the speed limit is lîfted. Probably only take about 12 guys 5-6 hours apiece on overtime (I hope), to make sure each instance is done properly.... safety first. C'mon - a tree branch on the road is all you'll get here to warn of an obstruction ahead555! kaptainrob, Ian Forbes and Cuzzy like this.